Tuchel’s Dortmund progressed in the DFB Pokal after they overcame Stuttgart with a slightly rotated squad as Durm came into the side at LW and Matthias Ginter took on the 6 position in place of the rested Weigl. Stuttgart used an interesting asymmetrical shape which shifted between formations situationally. One of the most interesting aspects of the game was Stuttgart’s use of an asymmetrical shape. Fielding what looked like a 4-2-3-1, they shifted closer towards a 4-3-2-1 with some distinct asymmetry across the midfield. On the right wing, Rupp would come inside and play much narrower whilst Didavi would move from his 8 position to act more as an attacking midfielder behind Kravets in attack. Playing between an 8 and a 10, it was Didavi who was a crucial point of the shape as Stuttgart could move between a number of different shapes according to the situation at hand. Towards the opposite flank, Kostic was much more orthodox than his right-sided teammate and played as a winger through the left. In defence, Stuttgart took on a more standard shape and would shift between a 4-5-1 and a 4-4-1-1/4-4-2 due to the man-orientated nature of their defensive scheme. Due to the orientation of their defence, at times it could even lack a distinct shape due to Dortmund’s attacking movements off of the ball. After somewhat of a disorganised opening, Stuttgart appeared to be marking man-for-man, which was particularly evident in the midfield as they would follow their man quite far out of position. Both Gentner and Die covered the two Dortmund 8s in Gündogan and Mkhitaryan whilst Didavi moved up onto Matthias Ginter. Through this they looked to make the game more of a physical contest and restrict clean build-up for the away side which for periods was relatively successful. Stuttgart marked with man-orientations in defence. Due to Ginter’s dropping movements in build-up, Stuttgart often shifted to a 4-4-2 shape as Didavi would cover the German pivot and situationally move off him through the use of cover shadows to apply pressure on the ball alongside Kravets. The horizontal and vertical compactness levels were fairly standard, perhaps being slightly below the average for a Bundesliga side though bigger issues lied in their lack of staggering. Particularly between their 4-5-1 and 4-4-2 shapes Stuttgart lacked any staggering and were organised in 3 straight lines of players. 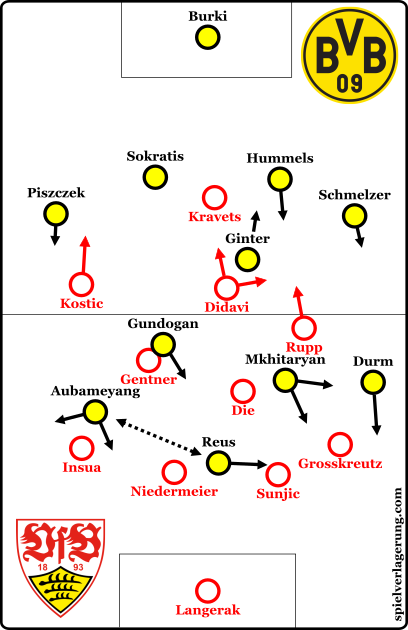 This reduced their ability to main spatial compactness and there were clear gaps between the lines for Dortmund to expose in possession with the highly-positioned Gündogan and Mkhitaryan. During the build-up to the first goal in-fact, Mkhitaryan found the ball in space behind Didavi and was able to move the ball across the edge of the box before picking out a free Aubameyang on the right. As Tuchel suggested in the build-up to the game, Dortmund fielded a slightly weaker squad with Durm and Ginter coming into the starting eleven. This saw some changes to the possession game as expected, considering that they fielded 3 full-backs. Durm acted as a fairly orthodox left winger with standard movements down the left as he combined with Mkhitaryan quite well through the game. Ginter acted in the 6 position which he is more commonly occupying in the absence of Weigl. Again a limiting factor in Dortmund’s game, Ginter was distinctly static as their defensive midfield and would play quite closely to the centre-backs. He didn’t drop between the two, though situationally the midfielder would provide balancing movements for Hummels when the centre-back looked to carry the ball higher up. Playing in more of a clear 4-3-3 as opposed to usual their 4-2-3-1/4-3-3 cross, both Mkhitaryan and Gündogan acted as eights in the system and took on very advanced positions. Whilst Ginter was deeper trying to help in the build-up, the pairing would often be positioned between the lines of midfield and defence looking to find possession in the 10 space. They achieved this very early in the game, as Mkhitaryan received the ball behind Didavi to provide the pre-assist for Reus’ opener. A striking difference between Dortmund’s usual possession game was the orientation of the two full-backs. Tuchel made the interesting decision to use both Schmelzer and Piszczek in deep roles in possession, even when the ball was high up in the Stuttgart half. With Durm and Aubameyang performed the task of stretching the opposition higher up, the full-backs sat generally in the defensive line if not slightly higher. This was a stark contrast to their usual structure as Dortmund’s full-backs usually stretch the opposition well in very high positions, allowing a centrally-focused shape as the wide players come inside towards the centre. From a deep position they supported possession acting as a supporting player in the structures through the wings and half-spaces and sometimes would aid in combinations too. They displayed decent playmaking abilities and Schmelzer particularly supported with some strong passes into the left half-space to break the lines and potentially initiate combinations too. Although I’m not certain why Tuchel made this choice, it seems like it was influenced by a number of factors in the team. Firstly, with Durm and Aubameyang occupying the flanks higher up, the full-backs would’ve been somewhat redundant higher up. The 4-man defensive line in possession also provided protection against potential counter-attacks – something which has been one of their biggest weaknesses this year. Some weaknesses were evident in this structure, yet they were rarely and only shortly exposed by Stuttgart’s defensive scheme. 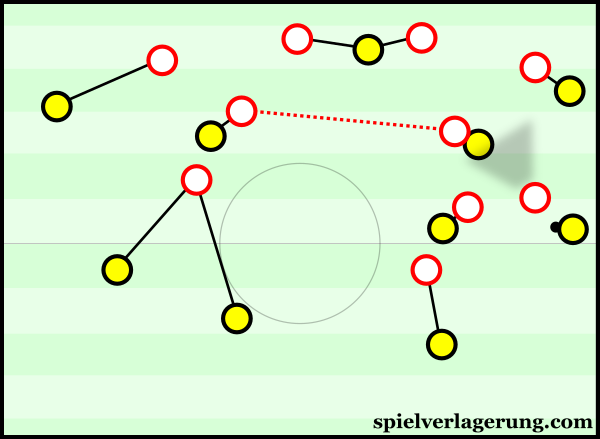 When the full-backs were occupied by a marker, Dortmund struggled to then progress the ball into midfield however this wasn’t exploited as Stuttgart only pressed high enough for short periods. Schmelzer makes an inaccurate pass out of play under pressure from Stuttgart. For that above-mentioned 15 minutes in the first half, Stuttgart looked stronger as they defended in a higher block with man-orientations to stop Dortmund from building-up cleanly. The two wingers moved up to cover Schmelzer and Piszczek and as a result, the whole of Dortmund’s defensive line was covered. Usually, with high full-backs Dortmund can have their attacking midfield quite central and would then have greater occupation of the middle thus resulting in better access. However as Durm and Aubameyang were both quite wide, they didn’t have a similar central presence and due to this they couldn’t move the ball upfield well when under pressure. The high positioning of both Gündogan and Mkhitaryan left Ginter quite isolated in the centre and Dortmund unsurprisingly couldn’t channel the ball through the one pivot. Stuttgart’s press began to become more and more conservative after Dortmund found ways to get the ball in behind the midfield where the space was progressively increasing. Despite this, Tuchel’s side were noticeably weaker in the spell of 15 minutes before half-time as the game became more level, even if Dortmund had just regained the lead. Perhaps in reaction to this increased pressure, Dortmund emerged after the interval looking slightly more reserved in their game strategy. Tuchel’s side shifted away from their possession-oriented game and instead displayed a much greater focus on creating chances through counter-attacking and their impressive transition play. Meanwhile, they made a shift in structure too – Durm moved to the right flank whilst Reus shifted over to the left of the attack as Aubameyang took his place in the centre. Out of possession they sat deeper in more of a mid-block as opposed to their usual higher press and looked quite stable in their 4-1-4-1 shape. They restricted Stuttgart quite effectively and the home side failed to create many chances as they struggled more against Dortmund’s new setup. Through defending deeper they looked to invite Stuttgart further out of position in attack and then looked to counter into the spaces left behind. This highlighted a slight lack of game-intelligence from the home side as during the latter stages of the second half, you could see both 6s moving up simultaneously and leaving far too much room for Dortmund to take advantage of in transition. In reaction, Gündogan increasingly moved higher up and later on acted closer to a 10 than an 8 as the team defended in quite a clear 4-2-3-1 following the substitution of Reus for Leitner. Their counter-attacking strategy yielded some very good chances for Tuchel’s attack, many of which they squandered (though it wouldn’t be a true Dortmund game without Mkhitaryan missing a big chance, would it?) but ultimately they found a third goal late in the game to seal a good victory. Dortmund recorded a good win against a fairly impressive Stuttgart side. The game consisted of numerous changes from both dugouts, with some particularly interesting developments as the second half progressed. Tuchel showed his ability to make adaptions to a weaker squad and whilst not all of his in-game changes proved to be successful, he managed the game well through these shifts. My favourite place to go to after every Dortmund game, thank you from India!